In a clinical trial, UW Medical Center deploys a warm-preservation device to transport the donor organ. The first patient received the liver from his sister, who had died unexpectedly. Dr. Catherine Kling detaches the donor liver from the warm-preservation device in which it had traveled. Paul A. Hamilton, 47, of Seattle, received the organ in an eight-hour procedure Nov. 19 at University of Washington Medical Center. He is scheduled to be discharged from the hospital tomorrow after experiencing what one of his surgeons characterized as a “remarkable” early recovery. Less than 12 hours after surgery, transplant patient Paul Hamilton felt better than he had in years, he said. “I’ve seen so many patients the day after transplant – 30 years’ worth – and I can’t remember such favorable initial signs,” said Dr. Jorge Reyes, the hospital’s chief of transplant surgery. He attributed Hamilton’s positive results, in part, to the transport device, which circulates blood and nutrients at normal body temperature through the liver between recovery from the donor and transplant into the recipient. UW Medical Center is one of seven sites in the United States participating in a clinical trial of the device, TransMedics’ Organ Care System. 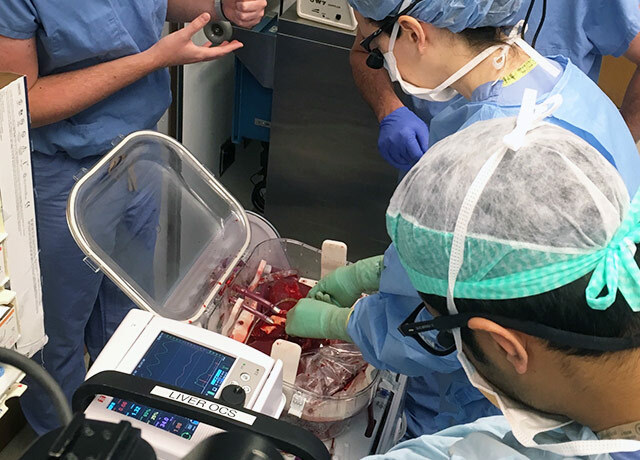 The trial’s aim is to determine whether the device preserves livers as well as transport in ice, the standard of care for decades, and whether the device can improve the viability of donor livers that might otherwise be deemed too risky for transplant. In a separate trial, the hospital is evaluating the device’s effectiveness with donor hearts. Hamilton’s joy at getting a lifesaving transplant after years on the wait list was tempered by great sorrow: The organ donor was his sister, Danielle Hamilton, 54, who had died unexpectedly a day earlier at Highline Medical Center in nearby Burien. Danielle had struggled with health problems for some time, but her death after a grand mal seizure stunned family members. Paul and his brother David Hamilton were with their sister at Highline when she was declared brain-dead. It was only when the hospital’s organ-donation representative appeared that they realized Danielle’s intention to be a donor, and the possibility that the family could direct her liver to Paul. The next day he was admitted to UW Medical Center for surgery. Danielle Hamilton, with her son in the 1990's. The randomized trial also includes hospitals in Massachusetts, Georgia, Michigan, Minnesota and Texas. UW Medicine is involved because of its transplant expertise and its massive patient-service area spanning Washington, Alaska, Montana and north Idaho. The warm-preservation device being tested is thought to be advantageous for donor organs, said Reyes, the surgeon leading UW Medicine’s participation. He assisted Dr. Martin Montenovo with Hamilton's transplant. “There may be no difference in time of transport, but we think there will be added benefit [with the test device] in letting cells wake up and start the healing process,” he explained. Cold preservation of donor livers has been conventional since the 1960s. The organ is flushed with a solution and put in a cooler of ice during transport. The cold doesn’t hurt the liver tissue, but without oxygenation, tissue cells slowly exhaust their metabolic energy and begin to die. “With this machine, we are bringing in oxygenated blood and other nutrients at normal temperature so the cells are awake, metabolizing and healing,” Reyes said, thereby making a prospectively healthier graft. Blood and nutrients flow through the donor liver graft in TransMedics' Organ Care System. Hamilton’s own liver had been ravaged by Hepatitis C, which he had contracted in 1986 via a blood transfusion, he said. The Hep C diagnosis did not come until 2012, though, when his weight ballooned. He came to the emergency room one day, struggling to breathe because one of his lungs had collapsed from the pressure of fluids collecting in his chest. That began a years-long health decline that saw Hamilton leave his information-technology job because of crippling fatigue. He was diagnosed with liver failure in 2014 and has been kept alive by medications. In the morning after Hamilton’s transplant, less than 12 hours after the operation, Reyes took a picture of his patient sitting up in a chair beside his hospital bed, smiling big and giving a thumbs-up.